Use on fruits, vegetables and animals as listed on the label. 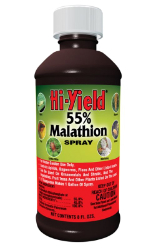 Provides an excellent control of aphids, thrips, spider mites, lace bugs, adult Japanese beetles, tent caterpillars, and others on fruits, vegetables, and ornamentals. Fruits, vegetables & ornamentals: 1-1/2 teaspoons per gallon of water. Flea control in kennels: 10 tablespoons per gallon of water to cover 1,000 sq. ft.